In our last post, we studied some details about the reticle inside a scope. In today's post, we will look into some more uses of reticles, namely rangefinding. We had actually dealt with this topic some time ago, when we talked about telescopic sights. 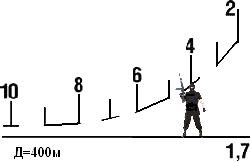 The key to rangefinding in most scopes is to compare an object of known height or width against a series of markings on the reticle, to determine how far away it is. We will see how this works with a few examples. 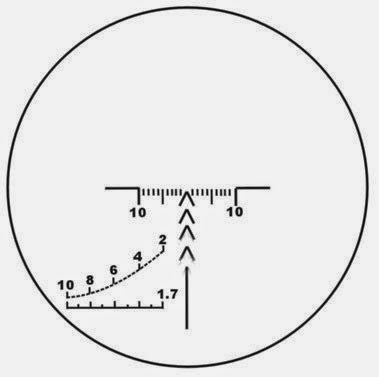 Reticle from a Russian PSO-1 Scope, as used by the SVD rifle. Click on the image to enlarge. Public domain image. Say the user is viewing a Land Rover vehicle, which is known to measure about 4 meters long (i.e. 13.12 feet long). Let's say that when it is viewed through the scope, it measures up to 8 markings long. Then, we put S = 4, mils = 8 in the above formula and calculate D = 4/8 * 1000, which works out to 500 meters. Therefore, the Land Rover is approximately 500 meters away from the scope. In this case, the person's head touches the 4 mark, which means that the person is about 400 meters away. Using this set of markings, the user can determine ranges from 200 to 1000 meters. The PSO-1 scope has a bullet drop compensator (BDC) to adjust range in 50 meter increments from 100 meter to 1000 meter ranges. Therefore, once the range to the target is determined, the user can turn the knob and adjust the elevation to correspond to the appropriate range and then align the target with the top chevron mark (^). Notice that the scope also has other chevron marks (^) below the first one. These are used to shoot at ranges beyond 1000 meters. The user sets the elevation to the maximum of 1000 meters, then uses the other chevrons to line up to 1100, 1200 and 1300 meters respectively. Now we'll look at another reticle. Reticle used by Schmidt and Bender scope. Public domain image. 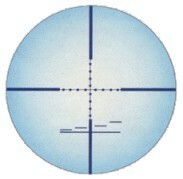 The above reticle is used by scopes made by Schmidt & Bender. Note that the center of the scope has several dots in the horizontal and vertical lines. These are called mil-dots and each dot corresponds to 1 milliradian. Therefore, if the width or height of an object is known, the user can determine the range by counting the number of dots that it covers and then using the same distance formula that we saw above for the PSO scope. Therefore, if an average person, who is about 1.7 meters tall (or 5 feet 8 inches tall), covers 4 dots when viewed in the scope, we can take S = 1.7, mils = 4 and plug it into the formula D = 1.7/4 * 1000, which works out to 425 meters. The average human head is around 0.25 meters high. The two lines that best frame the top of the helmet to the chin tell the distance to the target. For longer ranges, the same horizontal lines can be used, except that the user frames the top of the target's head to the belt buckle between the two lines. Using this, the user can measure distances between 400 and 1000 meters. Note that in both these instances, the scopes are fixed power models. Therefore the user cannot adjust the magnification power and the rangefinding calculation is easier. For scopes with variable power magnification, the method of rangefinding depends on whether the reticle is placed on the first focal plane (FFP) or second focal plane (SFP). Recall in our last post, we mentioned that if the reticle is placed on the first focal plane, the size of the reticle resizes with the magnification, so if the user zooms into the target, the reticle also appears to enlarge in size correspondingly. So, if a target measures 4 mil dots at 3x zoom, it will still measure 4 mil dots at 10x zoom, when using a FFP reticle. Therefore, for a variable power scope using a FFP reticle, the range calculation formula is the same as that of the fixed power scope, D = S/mils * 1000.
mag = Magnification power of the scope. As you can see, with a SFP scope, the range calculation is a bit harder to do because it depends on the magnification power setting on the scope. Therefore, some users usually set their scope at the power setting that it is calibrated at and leave it there, so that they don't have to do the extra math. For instance, in the above example, if the magnification power is set to 10x (i.e. the same magnification power that it was calibrated at), the formula simplifies to D = S/mils * 1000 (i.e.) the same formula as for a fixed power scope. Alternatively, if they change the magnification power, they change it to half or double of the calibration setting. For example, a Bushnell Elite 4200 6-24x40 variable power scope is calibrated at 12x magnification power, so if the user wants to change the magnification power, they usually select 6x or 24x, so that the range calculation can be modified by dividing or multiplying by 2. If the user chooses any other magnification power settings, the math becomes correspondingly harder. This is why many military scopes use fixed power scopes, to reduce the amount of math calculations that the user has to do, and also avoid the chance that the user makes an incorrect calculation due to not paying attention to the magnification power setting of the scope. This entire blog is absolutely fantastic. Thank you very much for your kind comments sir. It is always nice to hear from the readers of this blog :).